The museum will have three times as much gallery space as before, along with a new theater, atrium, and living wall. 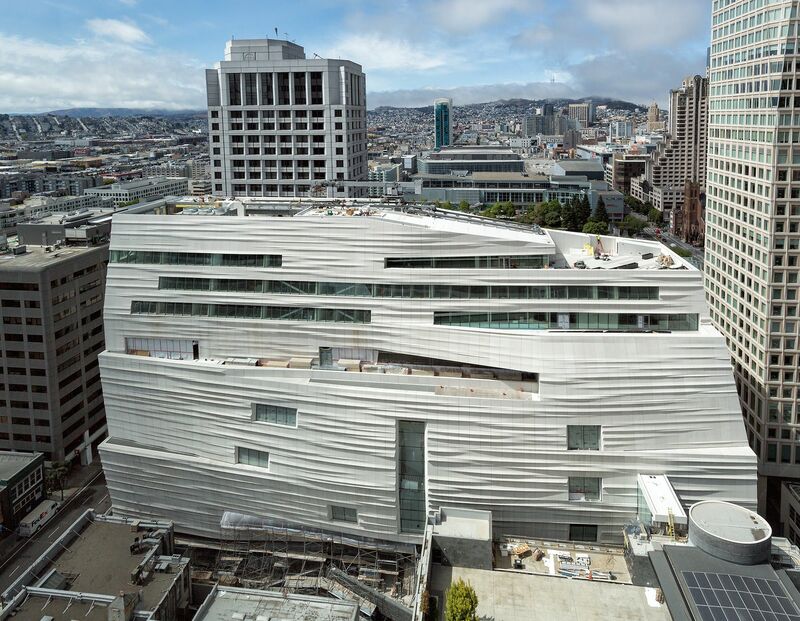 To call to mind the waters of the bay, the renovated San Francisco Museum of Modern Art (SFMOMA) uses more than 700 uniquely shaped fiberglass reinforced polymer (FRP) panels on its exterior, resulting in a tall, white, and wavy building. To really capture the eye, silicate crystals have been embedded to reflect changing light. The architecture firm Snøhetta designed a 10-story expansion to the SFMOMA. Along with the new façade, the museum will have 170,000 sf of new and renovated indoor and outdoor gallery space, which triples the previous amount. The galleries are intimate, flexible, and column-free, giving artists more freedom with which to work. The building has two main entrances, an education center, two restaurants, a coffee shop, a light-filled atrium, a third floor terrace with a public living wall with more than 19,000 plants, and a renovated Phyllis Wattis Theater, which now has a 4K projection screen. Interactive touch screens have been installed in the painting and sculpture galleries, and a new app gives visitors a guided audio tour through both the museum and the surrounding SoMa neighborhood. The museum opens May 14. More than $610 million was raised for the project, which has covered construction costs, the endowment, and support for education, art commissioning and exhibition programs. SFMOMA contains 33,000 works of architecture and design, painting, photography and sculpture. It also has the Doris and Donald Fisher Collection, a private collection of contemporary art featuring pieces by Andy Warhol, Roy Lichtenstein, and Tony Cragg. The museum was established in 1935. Swiss architect Mario Botta designed the museum’s current building, which opened in 1995. The Snøhetta expansion will be added onto it. SFMOMA. Photo: Henrik Kam, courtesy SFMOMA. Click image to enlarge. Helen and Charles Schwab Hall. Photo: Henrik Kam, courtesy SFMOMA. Click image to enlarge. The Campaign for Art Contemporary exhibition. Photo: Iwan Baan, courtesy SFMOMA. Click image to enlarge. The exterior cladding and the living wall at the Pat and Bill Wilson Sculpture Terrace. Photo: Henrik Kam, courtesy SFMOMA. Click image to enlarge.